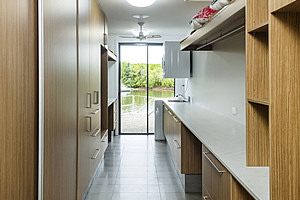 You'll need a metre­ plus clearance in front of appliances and adequate clearance for top ­loaders. 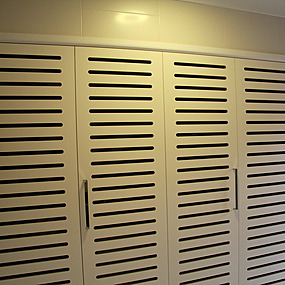 Position appliances so doors don't block through­ traffic. 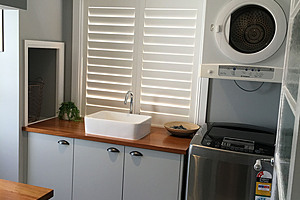 Save space with a front­loading washer and wall­ mounted dryer or combined washer­ dryer. 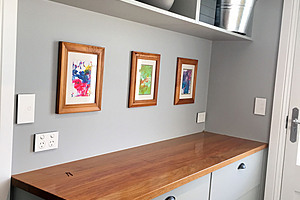 Include extra work surfaces for sorting, folding, ironing and sewing. Stainless steel sinks easy maintenance. 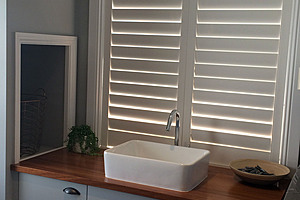 Choose hardwearing, stain­ resistant, waterproof bench top materials. 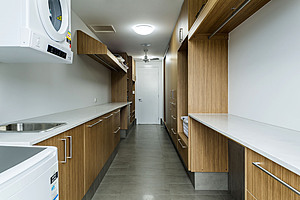 Laundry cabinetry lasts longer if finishes are heat and humidity resistant. 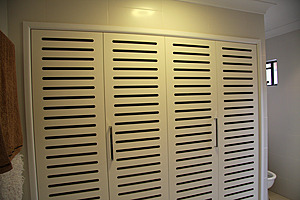 Add extra cupboards for cleaning, ironing, gardening, DIY and sports equipment. If space permits, install a fold­ down ironing board. If you have children or pets, include a high shelf for toxic household chemicals. Allow space for a dirty laundry hamper (under the chute if you have one). Pull­out wire baskets set under the workbench are an efficient means for sorting clean clothes. Sturdy wall or door mounted racks/hooks are handy for tools.